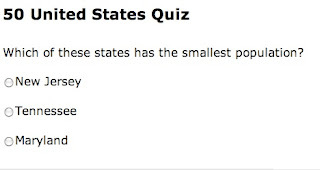 If you are teaching American geography, this "50 United States Quiz" is for you and your students. It includes over a 1000 multiple-choice questions that are presented randomly. The questions are available in the following categories: State Capitals, Bordering States, State Nicknames, State Flowers, State Birds, State Trees, State Induction Dates, State Sizes, Presidential Birthplaces, Historical Parks, National Parks, Bodies of Water, State Populations, Cities and Towns, and Famous Places. The look of the website is very simple and plain, sometimes too much. In addition, the buttons are not intuitive. They are using radio button (usually for options) instead of the regular "OK" or "Continue" button. However, once the user gets used to the odd interface, the quiz is a lot of fun.